The thrifting gods have been smiling on me lately and I'm on a roll that I hope doesn't end any time soon. LOL! First one of my best scores ever.....my first Stone fruit $10 for all at GW. Notice I said my first because I've heard that stone fruit is very addicting. Then this sewing cabinet that I'd love to get more info on. It still has a few spools of thread in the box but I'm having a hard time dating it. Any ideas from y'all? 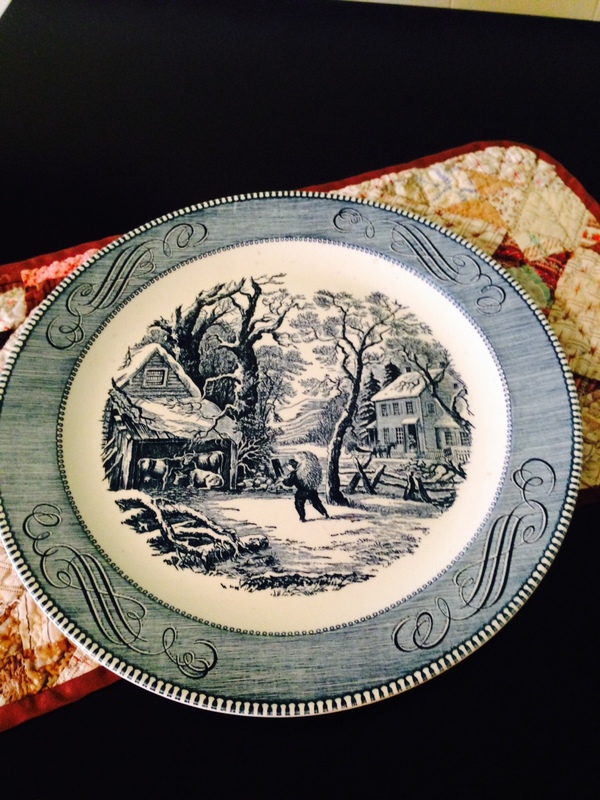 I've picked up several platters of this Currier and Ives pattern Blue from the 50's/60's and I just love it. The pieces that I've been lucky enough to pick up have all been under $3 each so this may also become a new collection but it will be one that I can use. OMG! You got the deal of the decade!!! It is easily worth $150.00 or more. Yeah for you. I have no memory of childhood except for a very few moments. Ridiculous but true. I wonder what toys I liked. You scored big time girl! Hi Donna - what a gorgeous cupboard and your Pewter collection is just wonderful. Never have I seen stone fruit. I see people collecting it but never see it myself. Love the sewing cabinet but never seen one like it before. Oh and the dishes - we collected that exact pattern in the early 80's from the Piggly Wiggly store - you got free pieces each week with so many $$ of groceries. We had the entire set. Loved it and wished I never got rid of it.